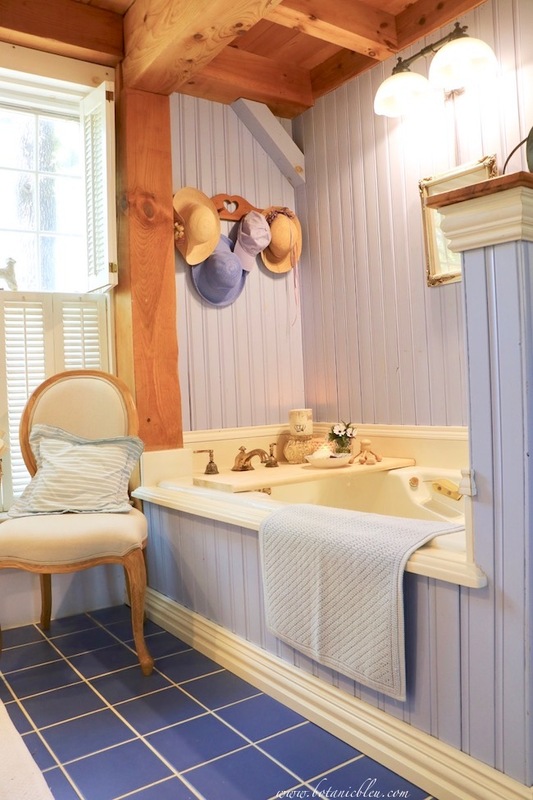 While refreshing our master bathroom I looked for ways to add more French Country charm to the bathtub. What was I looking for? Something beyond the French Country chair, French script candle, carved pedestal, and natural cotton bath mat. Something to hold flowers in a small crystal glass... white osteospermum with purple centers cut from the backyard flower garden. Something that goes with a wood post and beam house structure. A wire basket... considered, but not quite right. 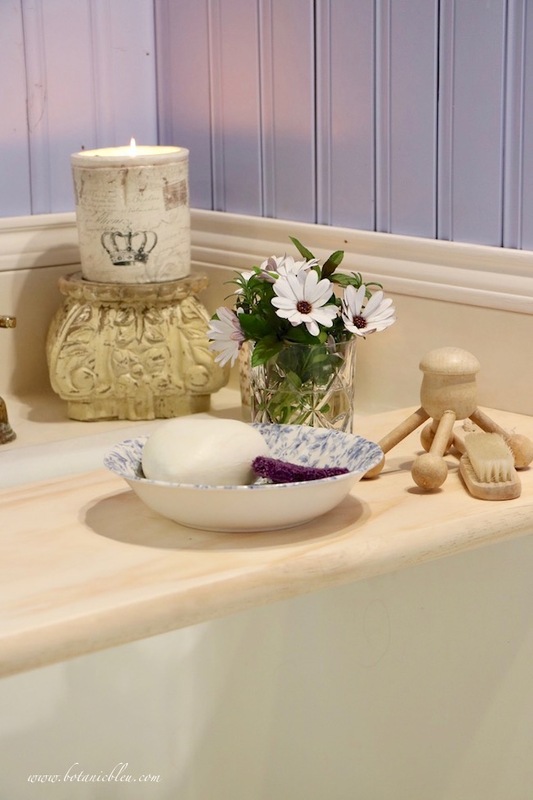 Wire baskets have holes that allow things to drop through, have uneven bottoms that cause objects to be unsteady, and wire could scratch the porcelain tub finish. Surely I could find a piece of wood in one of the wood stashes around the house. An 8" wide pine tongue-and-groove board left over from the house flooring might have been perfect, but the only pieces are buried beneath other left-over wood in the storage area above the garage. Sometimes the easiest solution to what you are trying to do is found just around the corner at your local DIY home improvement store. I just needed to walk around the lumber section to see what was available. Pine boards with knots were a possibility, but the prices for boards wide enough were more than I wanted to pay. The boards were also too long and were less than an inch thick. Cedar fence boards have 'character,' but are thin, not very wide, and maybe a little too much character. Bath cloths would catch on the rough finish. I wanted this project to be easy, and sanding is a lot of work. Then just as I was leaving the lumber section I spotted the wood stair treads for a staircase. Pine... like the house posts, beams, and doors. Ultra smooth, unfinished, yet ready to use. Just right thickness... not too thin; not too thick. Great width... just the right size to hold a magazine or book. 10 ½" wide by 4' long... too long, but see the perfect solution below. Best of all... the rounded bull nose edge on one side of the board. The finished rounded edge gives the tray a special detail feature. Home Depot had both oak and pine 4' stair treads in stock in my local store. The price of an oak tread is about twice the price of a pine tread. Online there are also cherry and hickory treads up to 5' lengths. A perfect solution for a board too long for your project... Home Depot workers cut the board to the length you want... FREE of charge. Ask at the contractor's counter. 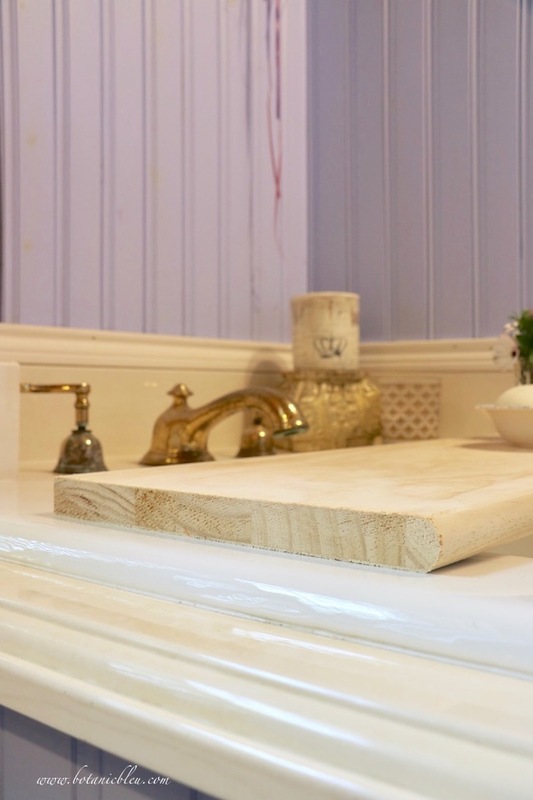 The DIY wood bathtub tray shown was cut to 34" long. 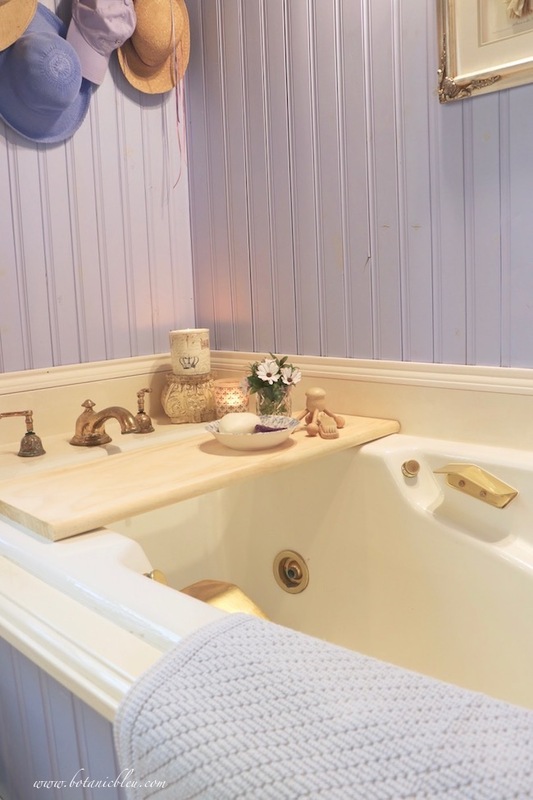 The tub is long and deep with whirlpool jets perfect for long soaking baths and for hot massages. After a long day working in the yard, the jetted hot water soothes my aching body and relaxes my sore muscles. Holding the bottom of my foot in front of the water jet is a fantastic foot massage. There was no need for a hot whirlpool bath after this project. There were no sore muscles from hard work. The DIY wood bathtub tray as shown is unfinished pine, but I do want to whitewash the tray to protect it from moisture. 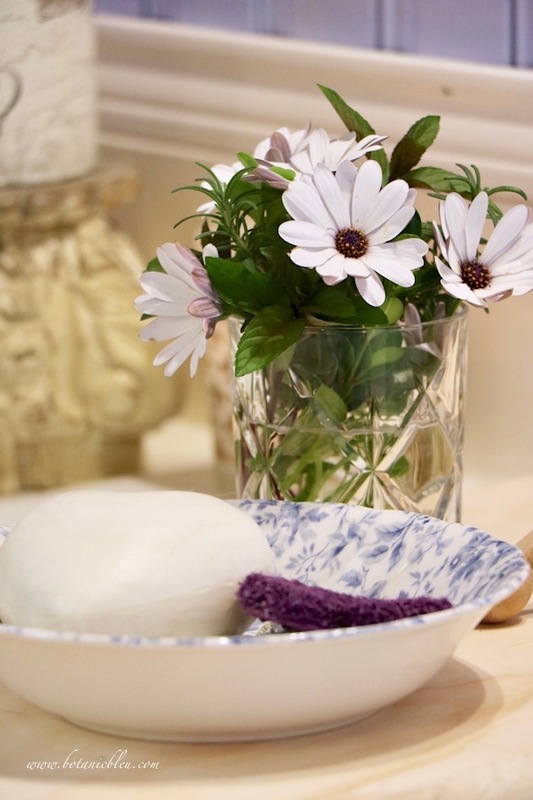 The whitewashed tray will look much like the linen closet door that is whitewashed. A satin clear sealer will help maintain the light color. The linen closet door was whitewashed over 28 years ago. 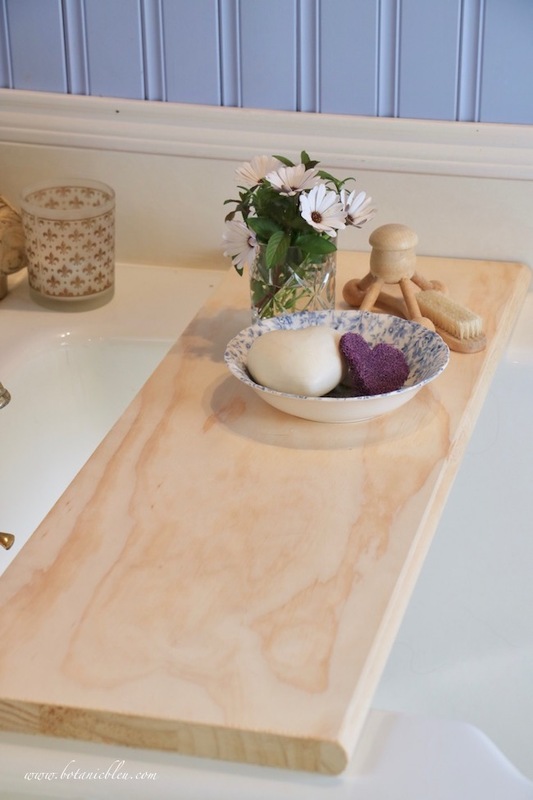 Want to make your own DIY wood bathtub tray? Here is a link to Unfinished Pine Stair Tread at Home Depot if you cannot find a pine stair tread at your local store. Work on the master bathroom small vanity is progressing. Photos and progress will be shared next week. 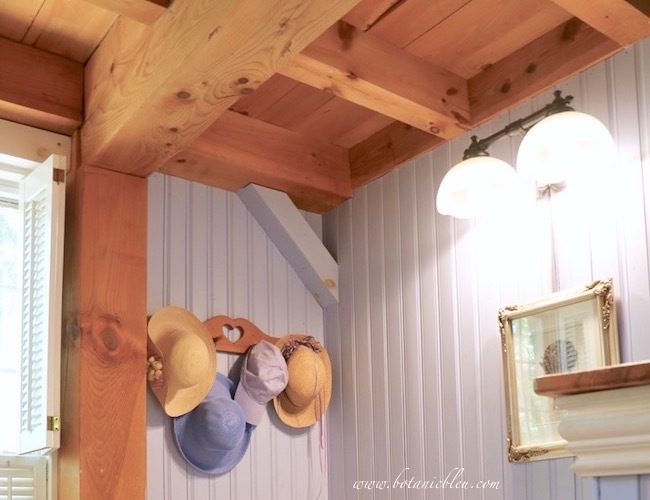 If you missed seeing what is planned for that area of the master bathroom, take a peek at Master Bath Small Vanity Update Plans. 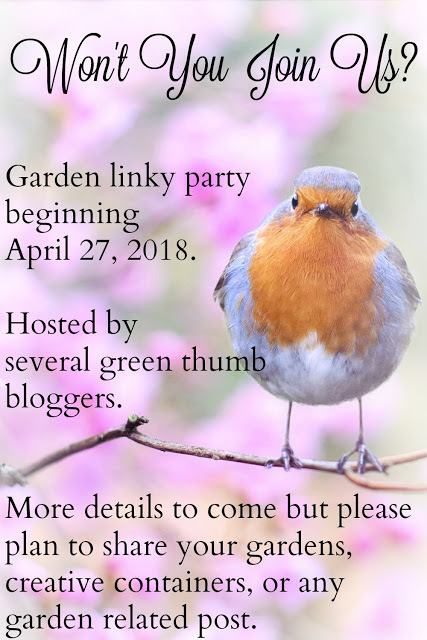 Also I plan to link up to a monthly gardening linky party beginning April 27. See details from Stacey at Poofing the Pillows. I know she and the other hostesses would love for everyone to join them. you will want to join the garden linky party, too! 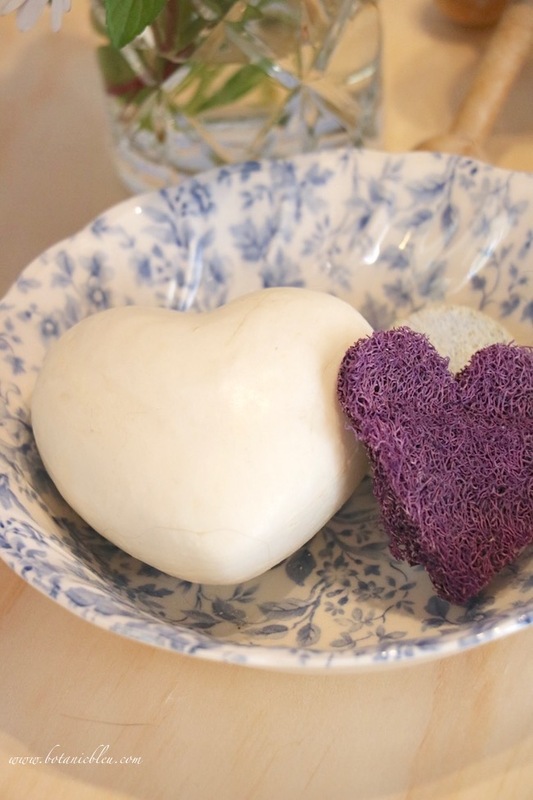 You have me yearning for a long, hot soak in a tub. 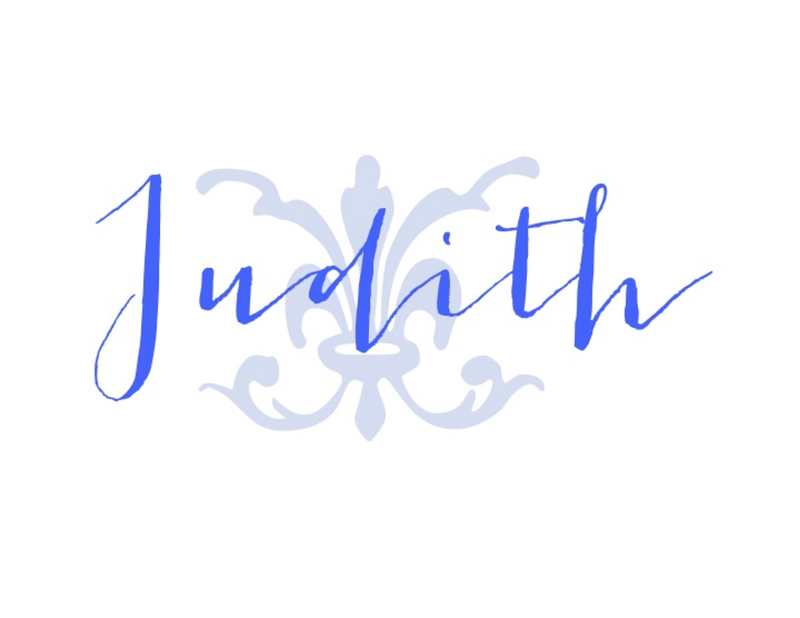 Beautiful photos, Judith! 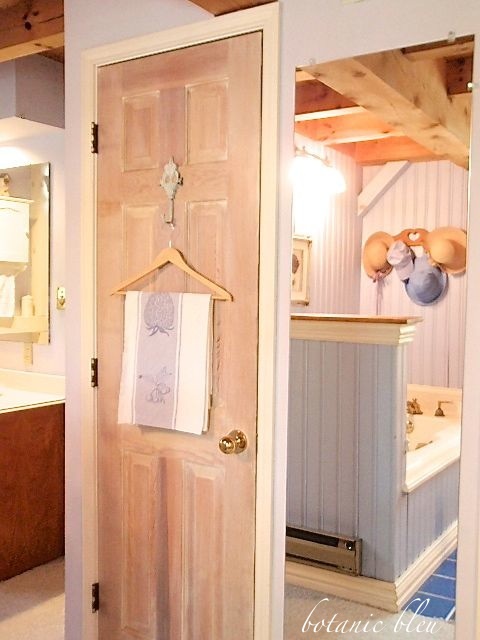 Your bathroom is so pretty. 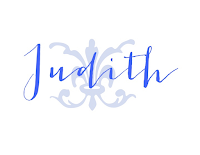 Using a stair tread was a great idea, Judith! Brilliant idea! Next on my list! Great idea. We used stair treads for our table leaves. 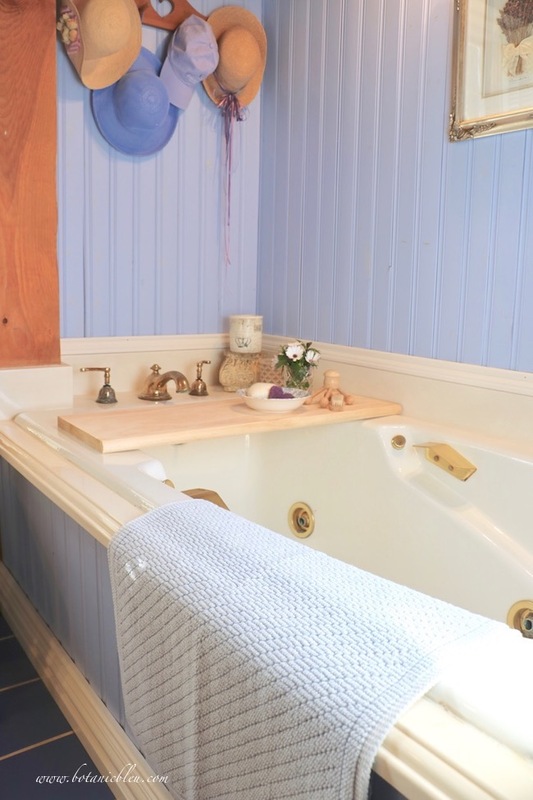 Your bathroom looks so calm and soothing. Thanks for sharing at Keep In Touch.